Coming soon to the PlayStation Vita is the coloful rhythm game, Superbeat XONiC. 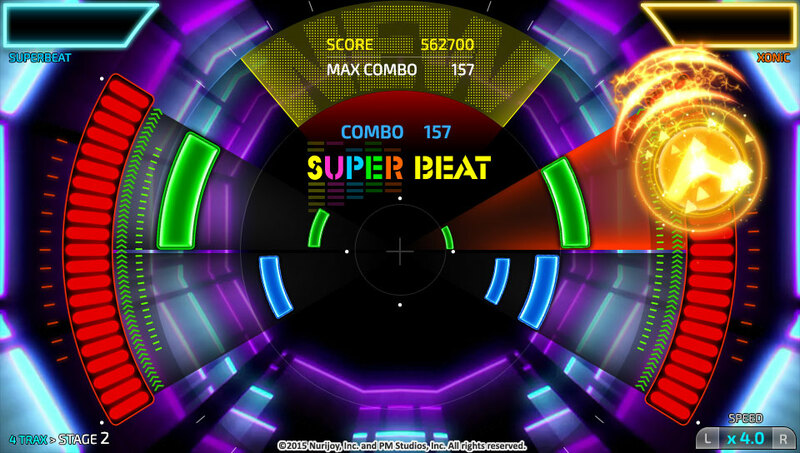 Superbeat XONiC comes from the developer Nurijoy with PMstudios and Actill. At its core, the goal is to get a high max combo by hitting as many icons as possible as they come flying towards the screen and get the best grade possible for each song. Superbeat XONiC has a variety of musical genres. There is pop, R&B, Classical, Electronic, Soul, and Metal music to listen and play to the beat. While many of the songs are not going to be familiar, it does not stop the music from being worthwhile. The lyrics themselves are varied as well. Some songs will have English lyrics and others will have Japanese, Korean, and whatever other languages I may not have noticed as I was playing. There are two modes to choose from, Stage and World Tour. Both modes offer their own experiences. The visuals are very colorful and are pleasing to the eye. The backgrounds are vibrant to keep you focused. It fortunately is not distracting to view for the player. Superbeat XONiC will come off as a basic package, but in reality, offers more than meets the eye. As for the controls, the Vita allows players to either use touchscreen controls or use button controls. I tried both out and preferred to use the button controls to time my presses with the beat. Both of your hands will get a workout throughout the game as, oftentimes, both hands will be used at the same time to hit the beat. There were times when my hand started to get tired and cramped from playing the game too long. This usually happened around the half an hour mark, but once I took a short break, I was able to get back to playing the game. As a nice perk for playing the game’s various modes, various songs and extra content is unlocked through an RPG-style experience point system. Some content includes DJ icons, and key sounds to use during a song to mix up the tracks. At the end of each song, you are graded based on how many beats you were able to hit and on your highest max combo achieved during the song. The better your performance during the songs, the more experience you earn for your DJ profile. Playing through the songs is the quickest way to unlocking content. For those who love leaderboards, there are both local and global DJ rankings. DJ rankings are calculated based on your combined scores through the game’s modes. Superbeat XONiC starts off easy but progressively gets harder. It will take some practice to master the controls and getting the best grades on every song will take dedication and effort. The game will be released November 10th both as a physical copy and as a digital download on the PS Vita. For anyone who has a PlayStation TV, Superbeat XONiC is compatible with the system. Get yourself rocking to some high upbeat music. If you want to know more about the game, I will be reviewing Superbeat XONiC this upcoming month and will let you know my thoughts on the full game.